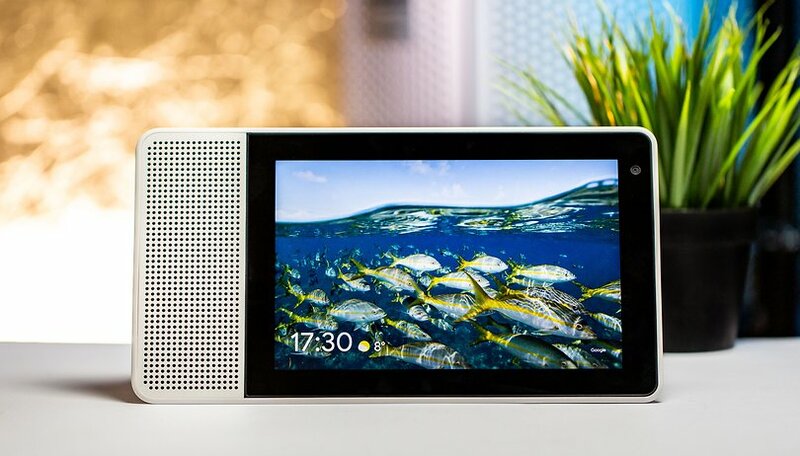 The Lenovo Smart Display has been out for some time in the US, but it is starting to turn up on European markets now too. We checked it out to see if adding a screen to your digital assistant is the next logical evolution of this smart home technology. In the US, the Lenovo Smart Display hit the market in October 2018. It was initially selling for $250, but you can get one today for a little as $160. Both the 8-inch and 10-inch versions are now available in the UK. The 10-inch version costs £229 and the 8-inch will set you back £159. For now, these smart displays are only available at a limited number of retailers, such as John Lewis. It was a UK 8-inch version that we took a closer look at. Unlike the Echo Spot, Lenovo has designed this thing with a much stronger focus on the visuals. The display is bookended by a decent sized speaker on the left, and a front-facing camera for video calls on the right. From the front, it looks like a tablet with a small Bluetooth speaker tacked onto the side. Around the back is where things get a little interesting. There’s a pyramid-shaped bulge that allows the display to be used in both portrait and landscape mode. The idea is that if you are using this thing to watch a video, you’d go for landscape, but portrait mode is better for video calls. It’s a shame that the display does not rotate like the one on your smartphone. Basically, the only feature that supports portrait mode is video calling via Google Duo. It feels like a missed opportunity, and one I really can’t understand the logic behind. The model we tested, the 8-inch, has a plain plastic back. The 10-inch model has a rather handsome bamboo finish on the rear, which I would be much more likely to leave on show in my house. The Lenovo Smart Display has no battery, so must be plugged in at all times. This is its biggest design flaw. It removes all portability. If you want to use it both in the bedroom as an alarm clock or morning weather forecast, and in the kitchen to display recipe information whilst you cook, you’ll either need to buy two of them or re-plug and re-boot it every time you want to move it. The display itself is quite nice. The 8-inch display that we have in our editorial office is HD (1,280 x 800), and that’s fine for YouTube and basic weather and news readouts. The 10-inch features an FHD display (1,920 x 1,200) which should offer an even more enjoyable viewing experience. Whilst the display is a touchscreen one, interaction is limited. You can swipe to the right to display a clean clock read out or swipe left to cycle through your Google Photos or wallpapers, whichever you have selected. Swipe up from the bottom opens a very simplified settings menu to adjust the volume, brightness, a Do Not Disturb mode and to change the Wi-Fi settings. A swipe from the top of the display allows you to interact with other devices that are connected with your Google Home app. That means the Lenovo Smart Display can also do a serviceable job as your smart home hub for controlling lights, thermostats, etc. Most of the interaction with the Lenovo Smart is done via voice controls and Google Assistant. Connected your Google Home app is painless, and for those who are familiar and comfortable with Google digital voice assistant, you’ll know what to expect. We won’ go into too much detail about the pro’s and con’s of Google Assistant in this article, since you can read our extensive coverage of the service at this link. What is important to touch upon here, however, is how useful a display with digital assistants such as this one is in 2019. There are times when it totally makes sense. When cooking, for example, being able to follow a recipe step by step, with visuals and video is superb. When asking for a news update, however, you’ll get the same audio summary you get on a Google Home Mini, but with a BBC News logo displayed, which is not so creative. Audio quality is important on these devices as you’ll need passable sound for most of the more popular functions. For video calling, both the speaker and microphones were absolutely fine. My colleague Pierre had no problems hearing either me or our photographer Laure, who was stood a few meters behind me during a call. On my side, audio was fine as I didn't need the volume very high. The quality dips as soon as you use the Lenovo Smart Display to listen to music or podcasts, however. There is some fairly basic Google Play Music integration, and you can link a Spotify account from your Google Home app. The 20W speaker output gets tinny at higher volumes, with an overwhelming amount of treble. Deciding on whether or not to buy the Lenovo Smart Display essentially comes down to two questions. The first thing you need to ask yourself is: do you need a display for your digital smart home assistant? My answer to this is yes, absolutely. As a kitchen assistant, in particular, I could totally see myself using this device on a regular basis, and having the visuals on board is a game changer. Video calling via Google Duo is great too - it's more convenient than having to scramble for your smartphone when you receive a call and holding it in front of your face for the duration of your conversation. The second question, having already said yes to the first, is: is the Lenovo Smart Display the one to buy? Your alternatives are fairly limited at this stage. The Amazon Echo Spot is not really a competitor, but the Echo Show is. There is also the Google Home Hub, which is very similarly priced and has a good-looking design. Then there’s the Portal from Facebook, which I would avoid due to privacy concerns. JBL is also working on a Link View which will no doubt come with better sound than the Lenovo. The Lenovo Smart Display was first to market and therefore picked up some traction, but the competition is now out, and consumers have more of a choice to make. If you can get the Smart Display at a reduced price in your region, it’s certainly worth taking a look at. I like mine. I think this review didn't really touch on my favorite thing about the device: it's a great digital photo frame. Having it seamlessly linked up to your google photos makes this thing fantastic for displaying old and new photos. The 8 inch screens sell in the US often for $100 and the 10 inch for $150. I've bought 4 between us and for family members. Everyone loves theirs. The screen seems more friendly than the disembodied speakers, which we also have.